According to the World Health Organization, 2 billion people worldwide consume alcoholic beverages. The world spends about $1.2 Trillion on alcoholic beverages every year and hangovers, which are 70% more common in light to moderate drinkers, cost the world economy about $1 Trillion in lost productivity. Alcohol consumption is the world’s third largest risk factor for disease and disability. It is a causal factor in 60 types of diseases and injuries and a component cause in 200 others. Alcohol kills 2.5 million people every year, which is 4% of all deaths worldwide. This white paper demonstrates that it is not alcohol itself which is the main causal factor, but its first metabolite Acetaldehyde, which is the real culprit behind almost all alcohol related biochemical harm. Almost all alcohol induced biochemical harm can be traced back to acetaldehyde, from alcoholic liver disease, cancer and even hangovers. This white paper highlights the damaging effect that acetaldehyde has on the human body, with many references to supporting scientific research on the subject. Our own study conducted by Select Pharma Laboratories demonstrate that Alcotox is able to reduce Acetaldehyde in common alcoholic beverages by a staggering 86%. The overwhelmingly conclusive result warrants further research into the Alcotox effect and holds great promise for significantly reducing alcohol induced biochemical harm and alleviating some of the economic burdens. Alcotox is a patent pending dietary supplement composed of a specific blend of amino acids and vitamins. It is designed to target, scavenge and neutralize acetaldehyde, the toxin that is produced by the liver when alcohol is consumed. Acetaldehyde is 30 times more toxic than alcohol itself and almost all alcohol related diseases from cirrhosis, cancer and even hangovers can be traced back to acetaldehyde. Alcotox does not affect the pharmacology of alcohol, only its toxicity, so it is still possible to become intoxicated. Alcotox products include Alcotox, Alcotox Liver Care, Alcotox Dual, Alcotox Oriental and Alcotox Liquid. Based in Stirling, Scotland, Select Pharma Laboratories is a modern MHRA approved QC testing laboratory operating in the pharmaceutical and medical device testing sector. Select Pharma Laboratories are able to offer full quality control support to the pharmaceutical industry. Our QC service capabilities include raw material testing, finished product analysis, stability testing, microbiology services and QP batch release. We can accommodate a wide variety of testing requirements from simple qualitative analyses to GMP studies for regulatory approval. Ability to provide analysis on pharmaceutical finished product, raw materials and other ingredients to British, European and United States and Japanese Pharmacopoeia (BP, EP, USP, JP) standards. The harmful use of alcohol is a particularly grave threat to men. It is the leading risk factor for death in males ages 15–59. Alcohol causes nearly 4% of all deaths worldwide. 6.2% of all male deaths are attributable to alcohol, compared to 1.1% of female deaths. The following is a brief snapshot of a few articles in the media which highlight the harmful effects of alcohol on human health. Articles like these appear almost on a weekly basis. As we shall demonstrate in this white paper, it is not alcohol itself which is the main causal factor, but its first metabolite Acetaldehyde, which is the real culprit behind almost all alcohol related biochemical harm. A 2012 publication by Onmedica – “Alcohol strategy skewed towards public order rather than health” highlights the fact that the government’s alcohol strategy is too concerned with public order rather than the impact on health of alcohol misuse, which is “more insidious and pervasive,” according to MPs. The annual death toll from alcohol-related conditions is more than three times that of road traffic accidents, and costs the NHS up to 3% of its annual budget. A recent article in The Guardian newspaper reports that the UK Faculty of Public Health (FPH) says harmful drinking has become so common that “no nonsense” warnings displayed in a prominent place on alcohol products are needed to overcome widespread public ignorance about the dozens of medical conditions excessive consumption can cause. A new study by the National Cancer Institute of 1,900 post-menopausal women found that consuming seven to 14 alcoholic drinks per week — in other words, one or two a day — carries a 30 percent to 60 percent increase in breast cancer risk. The Office for National Statistics reveals that the professional classes are now the most frequent drinkers in the country and that 41% of professional men drink more than the recommended daily limit of three to four units at least once a week. Women are also drinking much more than they used to, with alcoholic liver disease now split evenly between the sexes. Hospital admissions for alcoholic liver disease among people in their early-30s in north-east England have increased by more than 400% over eight years. It compares with the national rise of 61% and described as an “epidemic”. The figures were produced by health campaign group Balance, whose figures found 189 hospital admissions for 30 to 34-year-olds in 2010, compared with 37 in 2002. The organisation also highlights hospital admissions among people in their 20s and in their teens. Newcastle University and Newcastle Hospitals liver specialist Dr Chris Record said: “Only a few years ago alcoholic liver disease was very unusual in this age group and, unless our drinking habits change, the problem is only set to worsen”. When alcohol is consumed, it is processed by two important liver enzymes. The first enzyme, alcohol dehydrogenase, ADH converts the alcohol to acetaldehyde. The second enzyme, aldehyde dehydrogenase, ALDH converts the acetaldehyde into acetic acid, which is then broken down into carbon dioxide and water, which is subsequently eliminated from the body. Acetaldehyde is the toxic by-product of alcohol metabolism. It is used in industry in the manufacture of plastics, adhesives and fabrics. It is chemically similar to formaldehyde, which is used in insulating foams, plywood, particleboard and embalming fluid. In October 2009 the International Agency for Research on Cancer updated the classification of acetaldehyde stating that acetaldehyde included in, and generated endogenously from alcoholic beverages, is a Group I human carcinogen. the blood stream. The accumulated acetaldehyde exerts its toxic effects by inhibiting the mitochondria reactions and functions. A high acetaldehyde level impairs mitochondria function; metabolism of acetaldehyde to acetic acid decreases, more acetaldehyde accumulates, and causes further liver damage. A 2008 Oral Cancer Study by Kings College detected the presence of alcohol-induced acetaldehyde in oral mucosal cells. During alcohol ingestion acetaldehyde reacts with proteins in the mouth to form rigid bonds with amino acids, otherwise known as adducts. This reaction interferes with both protein structure and function irreversibly. As a result the immune system recognises these adducts/bonds as foreign and fires off an inflammatory response. In such cases, Acetaldehyde may also bind to DNA and blocks DNA repair machinery thereby triggering mutations and instigating cancers. A further combination of both tobacco and alcohol increase the dangers of acetaldehyde, and thereby the risk of cancer. Oral cancer affects around 4,600 people in the UK per year and the disease is more common in Scotland. It is a highly lethal disease and five-year survival is around 50 per cent. At least three people die of or with oral cancer every day in the UK. The MRC, (Medical Research Council) has expressed an interest in funding Alcotox research and we are in the planning stages of funding our own cancer study, which will investigate the chemo-protective effects of Alcotox. An Alcotox mouthwash product is in the pipeline, which aims to neutralize acetaldehyde before it is able to bond with proteins and thus reduce some of the cellular damage. We hope to make this product available towards the later part of 2013. The link between alcohol and cancer is well established according to Cancer Research UK. A 2011 study published in the British Medical Journal – BMJ estimated that alcohol consumption causes at least 13,000 cancer cases in the UK each year – about 9,000 cases in men and 4,000 in women. Cancer experts agree that for every additional 10g per day of alcohol drunk, the risk of breast cancer increases by approximately 7-12%. reveals a BBC report What damage does alcohol do to our bodies? Acetaldehyde is toxic and has been shown to damage DNA. The Medical Research Council’s laboratory of molecular biology in Cambridge recently completed a study into the toxic effects of alcohol on mice. The results showed that a single binge-drinking dose of alcohol during pregnancy might be sufficient to cause permanent damage to a baby’s genome. It is known that a significant percentage of people of oriental descent are unable to metabolise alcohol effectively. Dr Toru Nagao, Chief Maxillofacial Surgeon at Okazaki City Hospital in Japan contributed tissue samples from a Japanese population for comparison with British subjects. The conclusion states “There are genetic differences in Japanese populations that affect metabolism of alcohol, and few who cannot further breakdown acetaldehyde due to missing enzymatic mechanisms”. Many people of oriental descent have a genetic mutation that limits the formation of aldehyde dehydrogenase, resulting in a build up of acetaldehyde, which can be toxic in large quantities. The symptoms of Asian flush include excessive facial redness, sweating, increase in body temperature and a higher heart rate after consuming even a small amount of alcohol. The Alcotox Oriental product is specially formulated to compensate for the reduction of the aldehyde dehydrogenase enzyme. A 2008 research paper in Food and Chemical Toxicity demonstrates that Acetaldehyde content varies considerably amongst different alcoholic beverages. Beer (9 mg/l) had significantly lower acetaldehyde contents than wine (34 mg/l ), or spirits (66 mg/l). The highest acetaldehyde concentrations were found in fortified wines (118 mg/l). The residual acetaldehyde concentrations in the saliva after swallowing were on average 195 μM for beer, 734 μM for wine, 1387 μM for spirits, and 2417 μM for fortified wine, which are above levels previously regarded as potentially carcinogenic. A practical definition of a hangover is a state of distress, which occurs after Blood Alcohol Content (BAC) has reached zero. Symptoms typically include nausea, headaches, restlessness, sleep disturbances, tremors, muscle aches and fatigue. Acetaldehyde is not present during hangovers; by the time hangover symptoms are experienced the acetaldehyde has already been metabolised by the body and is normally absent at this stage. The consensus amongst researchers appears to be that hangover symptoms are caused by the aftereffects of acetaldehyde on the central nervous system. A 2000 study published in Journal of Alcohol and Drugs evaluated hangover symptoms in Asian Americans (men and women of Chinese, Japanese and Korean descent) with variations in the ALDH2 gene. Following alcohol ingestion, they exhibited more intense reactions to alcohol and generated higher levels of acetaldehyde. The subjects used Likert-type scale to estimate their severity of hangover symptoms. The results conclude that more severe hangover symptoms were experienced with this group as compared to the general population. A 2002 study in Journal of studies on alcohol reviewed alcohol consumption amongst college students and The Alcohol Hangover by Jeffrey Wiese reveal that hangovers are much more common (70% or more) in light-to-moderate drinkers than in heavier drinkers. Although hangovers may be thought of as being trivial, the costs to the economy are staggering. A 2006 study by the CDC (Centre For Disease Control And Prevention) revised the cost of hangovers to the US economy upwards to $223 billion. Approximately 75% of these costs were due to binge drinking. Binge drinking is the most common form of excessive alcohol consumption in the United States and in the UK. Similarly in 2008, in the UK, The Department of Health estimated the annual cost to the economy at approximately $40 billion. The cost of hangovers to the worldwide economy is estimated at over $1 Trillion. Sometimes the argument is made that Alcotox is an excuse to drink more. This is not true of course and may have more to do with the fact that Acetaldehyde is not generally well known outside of academic circles. Examination of the evidence put forth in this white paper, and the destructive power of Acetaldehyde becomes abundantly clear. Alcotox is designed to do one thing extremely well, and that is to target, scavenge and neutralise acetaldehyde. Alcotox is capable of reducing 86% of the Acetaldehyde in common alcoholic beverages and therefore holds great promise for reducing some of the biochemical harm that affects so many people worldwide. Select Pharma laboratories conducted the following study to investigate the effects of Alcotox on reducing the acetaldehyde levels of common alcoholic beverages. The dosage used was standard 975 mg Alcotox ( 1 size 00 capsule ) and 1 standard drink equivalent of the alcoholic beverage under test. 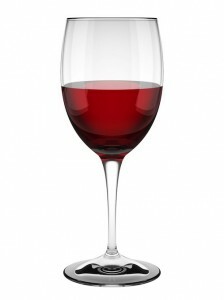 To investigate the effects of Alcotox on reducing acetaldehyde levels in wine. 125 ml of white wine at 12.5% alcohol concentration was used in the test. 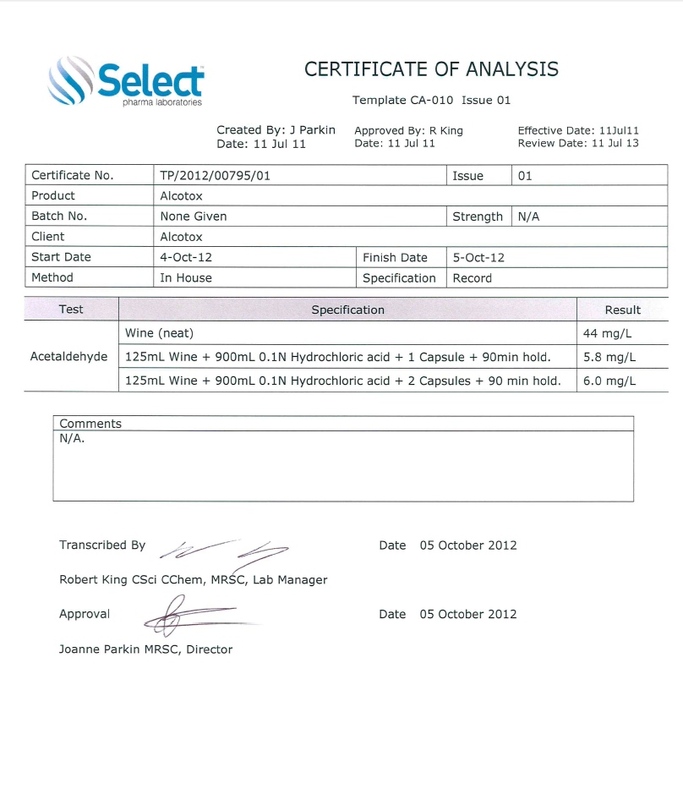 The measured baseline acetaldehyde level was 44 mg/litre. To simulate stomach acid conditions, the white wine was mixed with hydrochloric acid solution and incubated for 90 minutes at 37 degrees Celsius. Single and double dose of 975 mg of Alcotox was administered and subsequent acetaldehyde levels were measured. Each test was run in duplicate. A single dose of 975 mg Alcotox reduced acetaldehyde present in the white wine by 86.8%, from baseline 44 mg/l to 5.8 mg/l. The results are overwhelmingly conclusive and demonstrate the powerful ability of Alcotox to target, scavenge and neutralise acetaldehyde. The results justify further research into the Alcotox effect.